BERLIN - Mauro Gozzo grew up playing baseball in Berlin, starred for the Redcoats’ high school team and now, he’s looking forward to beginning his professional managerial career so close to home. 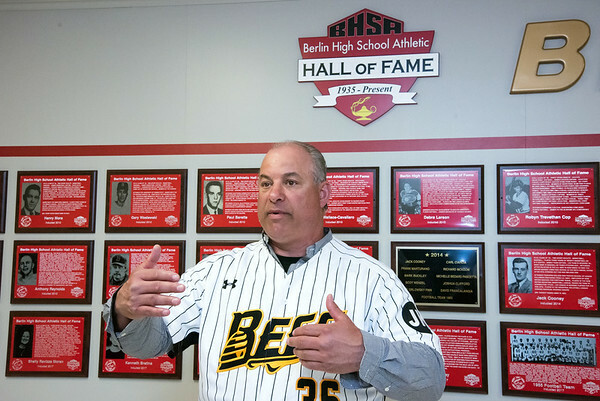 Surrounded by faculty, coaches and members of the Berlin High School Athletic Hall of Fame Tuesday afternoon, the New Britain Bees manager spoke about building excitement between the Atlantic League team and the town, the quality of players the franchise has brought in and what the former Redcoat wants to accomplish. It will certainly be an interesting season for the former Major League pitcher. He’s still in the process of building his roster for the upcoming year, one that he hopes will lead to the franchise’s first playoff appearance, and will have to deal with the Atlantic League’s new rules following its partnership with Major League Baseball. The Bees already have eight players signed with MLB experience, but the new manger also knows it comes down to execution and production. Last season, New Britain ranked sixth in runs scored with 552 and sixth in OPS at .716. The league’s new rules might also affect those numbers. Computers will be used to help home plate umpires for ball/strike calls by a TrackMan radar tracking system, bases will be enlarged by three inches to 18 and while the distance between the pitching rubber to home plate will be extended from 60 feet, 6 inches to 62 feet, 6 inches in the second half of the season, beginning July 12. In addition, no mound visits will be permitted by players or coaches, other than for pitching changes or medical issues, and pitchers must face a minimum of three batters or reach the end of an inning before they can exit the game. The Atlantic League will also require two infielders be on each side of second base when a pitch is released. But Gozzo and the organization believe the league is ready to take on those challenges and as Gozzo looks to build a winning culture in New Britain, he also knows is good to be back home. Posted in Newington Town Crier, New Britain Bees on Tuesday, 2 April 2019 20:58. Updated: Tuesday, 2 April 2019 21:01.